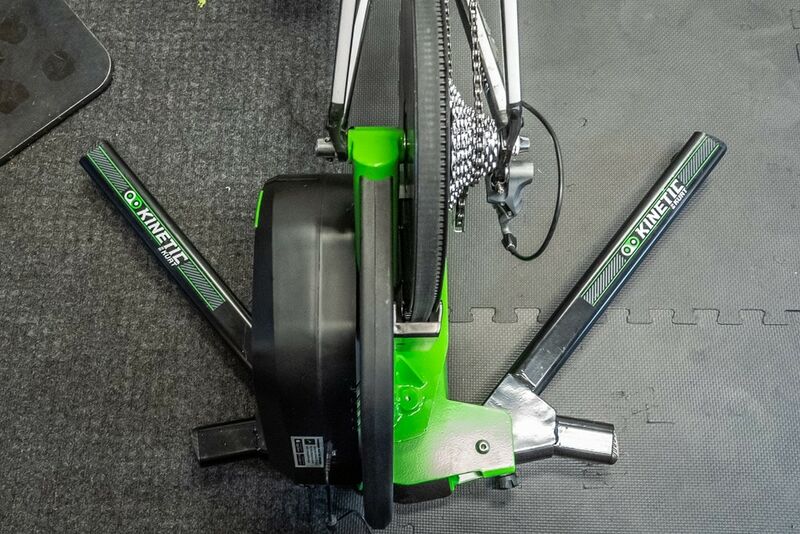 And just like that, Kinetic has joined the direct drive trainer flotilla. But unlike everyone else, their trainer actually rolls. Or tilts I suppose. I guess it could roll if you fall off it. Kinetic has taken their popular Rock & Roll series of trainers that spans back more than a decade, and upgraded it to the digital (and direct drive) era. The new R1 trainer supports all the protocols and features you’ve come to expect on a trainer in 2018 – such as dual ANT+ & Bluetooth Smart support, as well as support for a variety of cassette and thru-axle types. Anyway, let’s not get ahead of ourselves, time to dive into all the details! In some ways, the R1 is the culmination of many different pieces at Kinetic finally coming together into one cohesive package. Sure, they’ve been doing rollin’ trainers for years, but never direct drive ones. And they’ve been doing smart controllable trainers for years, but never on fully open ANT+ & Bluetooth Smart standards. The R1 takes all of those pieces and now makes a product that’s very clearly targeting likely a different market than their previous efforts. It’s also in a lot of ways likely to be a second chance for the brand that lost a lot of love back two years ago when they decided against following industry standards. But we saw them turn that tide earlier this summer with the Kinetic inRide V3 pod (now dual ANT+/BLE), as well as what I’ll discuss in the next section too. Kinetic has stated loud and clear on all the calls I’ve had, and all the in-person meetings I’ve had that they want to be seen now as fully supporting standards. And they’ve put their money where their mouth is. I don’t know about you, but I just like specs sometimes. It’s clean and easy, and everyone finds out everything they need without having to read a bunch of text. Still, let’s pretend you like text – or, we want to talk about some things that aren’t great on bulletized lists, like road feel, rockin’ feel, or noise. That’s why we have text. Thus…let’s talk about that sway. Or rock. Whatever it is, it moves. Of course, their ‘Rock & Roll’ concept has been around for years and continues to be very popular. 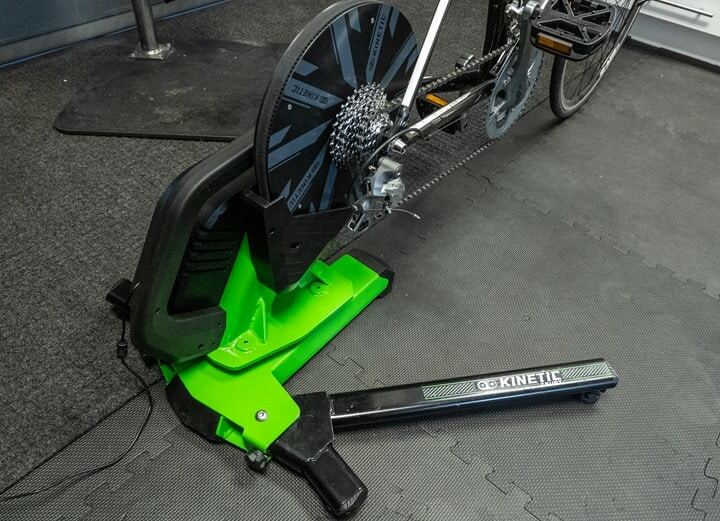 It’s likely the rise of rocker plates in trainer setups can be in part credited to the work that Kinetic did in marketing that concept (albeit a different implementation). With the R1 you’ll immediately feel the side to side movement when you attempt to mount the trainer. Like pushing a punching bag, it pushes away a bit at first. It can be slightly unnerving, but as long as you don’t try and do a dance routine on it, you’ll successfully mount it without any incidents. We measured the side to side max angle at about 15% (using a simple phone level). You could go beyond that (we got to 18%), but in doing so you had to be prepared to crash (indoors). Let’s be clear though, doing so took a very concentrated effort to tip it over. And just like outside (or any other trainer) you can eventually tip over your bike if you lean far enough. While it’s popular to show how a rocker plate or rockin’ trainer works during a sprint (as I did in my video above), in reality, I don’t think that’s actually the goal here. And Kinetic agrees. It’s really about movement. It’s about the subtle changes you’ll feel as you’re riding that gives you some relief on the saddle. Replicating the correct movement of a bike during a sprint is rare (many rocker plates actually inverse the direction the bike should travel). In this case, it’s more the natural sway left and right that you’re after. From a generalized road feel standpoint, I’d say on my brief time with it that it feels more or less like any other trainer in this price bucket. It responds nicely during the sprint and has a good spin-up associated with it. It’s no LeMond Revolution Pro, but neither is anything else sold these days. Since I don’t have one side by side with a KICKR or other trainer I can’t really give you a fair side by side assessment. It’s too difficult to do separated by days, but it’s close enough that I wouldn’t say it’s that much different. From a noise standpoint, it’s not silent. There’s no other way of stating that. It’s not loud, rather, it’s basically the same as most trainers aside from the silent Wahoo KICKR/KICKR CORE, Tacx NEO, and STAC Zero. Beyond that collection, most trainers are in the same ballpark – and this is in that ballpark (you can hear it in my video above). To date, only PerfPro supports that port unfortunately. Though I’ve gotta imagine as group competitions become a bigger and bigger part of Zwift, they’ll probably support it as well. One interesting tidbit not covered well in the specs section I put above is the accuracy claims. Currently, they’re officially going with +/- 3%, which is a bit beyond the +/- 2ish percent that most other trainers in this price ballpark are at (or even more accurate). This is mostly because they’re still working on the firmware and want to be a bit conservative on claims. However, they noted that their initial accuracy testing is showing more positive results than the +/- 3% claim, so it’s plausible they’ll tighten things up as they get closer to release date. Before we wrap things up, I’m just gonna drop a small nugget here for now: Two other new trainers. I suppose it might technically be one trainer, or three trainers, depends on how you look at it. Either way, they’re refreshing their entire lineup of Smart Control trainers. So that includes the Road Machine and Rock & Roll variants, as well as just the base resistance unit (in case you already have a kinetic trainer stand). The main change for these? New hardware that supports the same dual ANT+ & Bluetooth Smart resistance control and broadcasting. That’s a shift away from the proprietary Bluetooth Smart control of the past that got them into hot water. These new trainers should start shipping in the next couple weeks. They’re just finalizing some of the firmware bits. In fact, I’ve had one since earlier this summer sittin’ at the DCR Studio. I’ll get more hands-on once that firmware hits and I can dive into it in more detail. I’ve added the Kinetic R1 trainer into the product comparison tool below, allowing you to see how it stacks up against other trainers in the same price point. For the purposes of the below I’ve added in the Wahoo KICKR CORE, Elite Direto, Tacx Flux 2, and then the Wahoo KICKR (big one, just to set a ceiling on pricing). Of course, you can mix and match your own product comparison charts here. Don’t forget you can mix and match and make your own product comparison charts here in the product comparison database. Overall I think this is a solid next step for Kinetic. Over the last couple years they’ve lost a fair bit of market share in the trainer market, especially in the mid-range realm where the number of options have greatly expanded with plenty more features. The introduction of a bit of a higher end option (but without necessarily the super-higher end prices of the $1,200 range) might resonate well with those that were more loyal Kinetic fans in the past. Plus, those looking for a bit of motion in the ride but that don’t want to commit to a full rocker plate solution yet, this offers a fairly solid option. My only concern though is that I think pricing-wise they might have done slightly better at $999 versus $1,050 – purely from the perspective of how consumer brains work. Once you cross that barrier you start comparing it against the higher end trainers from a brand standpoint, which might be a tougher sell for some. Update: You can now pre-order the Kinetic R1 trainer from Clever Training. It’s expected to ship the first 10 days of October. You can use DCR Reader Coupon Code DCR10BTF to save 10% off your order, plus free US shipping. Doing so helps support the site here as well! Thanks for the review Ray, I had an old model Kinetic years ago. Good to see them trying. Given the way it moves, should it be used without a front wheel block? 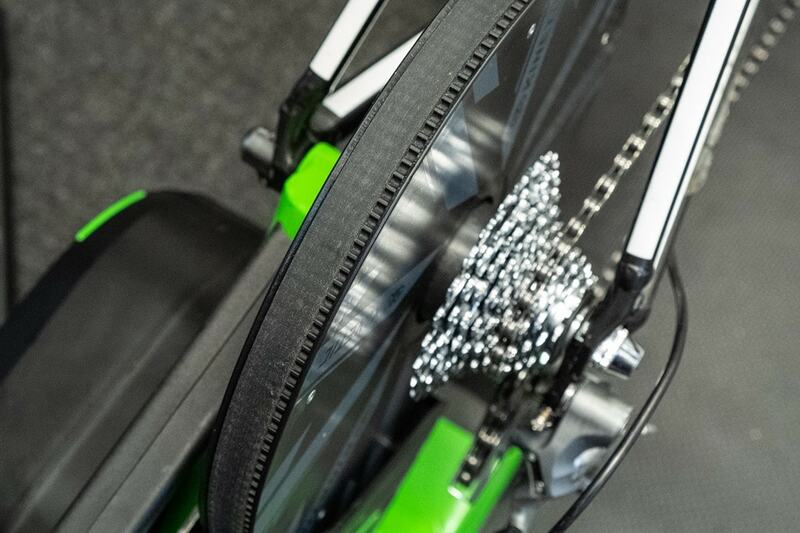 Not a comment on this trainer, but do you think that will be any news about the Tacx Flux 2 in the next few days? I’m thinking in buying a Kickr Core, but i’m waiting to see what tacx flux 2 brings. Also, can you tell me if the Kickr Core can simulate the higher grades in low speed that’s been announced on the Tacx Flux 2? The rocking will be interesting . I’m strangely excited about this trainer. I rode a Kinetic for years and really liked the feel and how sturdy the trainer was. I’m very happy to see them releasing a competitive smart trainer. Are you leaving out details about calibration and temperature sensitivity pending a final unit? Yeah, it’s just not known/clear yet. It does. But really, almost all rocker plates and such do for non-sprint action. It’s almost a case of any movement will help. The basic design difference from the R1 to most rockers is that the rockers are added to an existing trainer. The pivot point is below the deck that supports the trainer. As such, the effective Roll Axis location is lower when compared to our assumptions of how a bike leans when on the road. This will exaggerate the motion to a more lateral movement at the bars and saddle. The effective difference is small when you look at the true geometric differences, but it may be a valid consideration with the goal of being a closer replication of the true feel outside. I am doing a prototype rocker with adjustable pivot points to see what feels best and most “road-like”. That being said, 3%, not that I care, but at $150-200 more than others that are 2%? Is the rock and roll worth the additional bump in price? I shared the same concern. That’s the bit that they’re looking at increasing once they get more final firmware on them. Can a Wahoo Climb work with this? Side-to-side movement + incline = very realistic standing climb on the trainer! If not, I’ll have to choose between side-to-side (sprints) or incline (climbs) for my direct drive trainer purchase. From what I’ve read on the reviews/comments, the Kickr/Kickr Core doesn’t have as much side-to-side ‘give’ as the Tacx Neo. Only in manual mode. The CLIMB requires a Wahoo trainer to work in any automated modes. The Wahoo side is only one half of the equation. App makers also need to allow pairing directly to the Climb (and any other grade simulators in the future) directly via the app. Right now, there are not that do that. That is at least one reason that Wahoo makes you pair the Climb to the Kickr/Core/Snap. All things that can be overcome. But there may be issues too. From what I remember, the Climb may be ANT+ only for pairing. If true, that means it is not able to pair directly to apps running on BLE. Maybe Ray knows for sure if the Climb currently includes BLE? That issue could be resolved on future models, but is a consideration along with all the others, even if Wahoo “unlocks” it. No power cord required?! Now that I like! Looking forward to learning more about that. It has two modes you can toggle between. One is a regular interactive trainer mode that requires power. The second mode you’ll use the app to switch into (before you leave home) that puts the magnet in a position that makes it act like a traditional non-smart trainer with power. 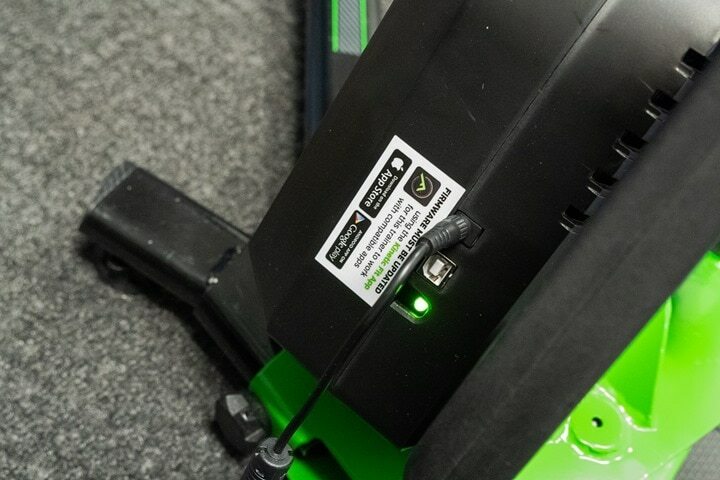 That is good news that the wheel-on Smart Control trainers will be updated with full connectivity compatibility as well ! Last email exchange I had with KK about that, they simply said “soon!”. Perhaps they will announce availability at the beginning of November, however I wonder if they will be pushing the price point of the revamped wheel-on’s up as well ? They will have some catching up to do with the likes of Wahoo Kickr Snap and the new Cycleops M2. That said, the Stac Zero Halcyon is looking like a decent ‘betweener — between the best of the wheel-on trainers, and the budget friendly direct drive units. So they will update their older trainers with firmware to use a standard control protocal or only new units going forward? Current smart control models will get firmware updates for FTMS but that is still undergoing some testing. I do some product testing for Kinetic and it works pretty well but there are still some rough edges with some apps to get the transitions for ERG ramps or virtual hills to work cleanly. Just to get it straight. The only difference between old Smart Control units and new ones will be the ANT+ or there will be other things? More interested in the accuracy field, since I bought the SC upgrade kit and don´t plan to buy another trainer soon. I don’t think anyone outside of the KK people and early access people like Ray and Shane know more details. They hinted at a sea change to ANT+/BLE standardization across all of the new/updated products. But I don’t think they have really shared more than that. So… If you had to choose one…. Up and down or side to side? Rock and roll action, no even a close option, IMHO. 1) The rock and roll action will be present in nearly every pedal stroke and every second of use when on the trainer. It leads to a situation where there are subtle shifts on the loading of the body on the saddle (just like every ride outside). These shifts are the primary reason for the notable improvement in comfort sited by the many builders and buyers of rocker plates in my group. I ran several polls last year related to rocker plates. Comfort won by a landslide over performance or simulation as the primary reason for and benefits of using a rocker plate. 2) The climb pitch control will only be present when you are riding a virtual course that has variation. As courses inevitably vary, the actual pitch angle variation and frequency will be different from one day and/or course to the next. It is cool in the sense that you can get even closer to a “bike riding simulator”. It will have some impact on the weight distribution for the rider and can likely improve comfort to a degree. But I feel the frequency and magnitude for this is less when compared to that of a rocker plate (or integrated rocking trainer). I look forward to more of both of these being visible and around for people to try. I feel that a rocker plate or motion trainer is the next big thing that will make the time that we spend on trainers much more comfortable, and likely rewarding. I am happy to see more options coming from the big guys as well as continued expansion of DIY designs from creative builders and users. Side to side, no doubt. My old Rock n’ Roller allowed you to actually train your arm and leg muscles and coordinate for sprinting / climbing when you get up. I guess I’m in the minority, but I tried a rocker recently and didn’t really like it. It didn’t make a noticeable difference in comfort, and I really didn’t like the inverse motion when standing. It’s really hard, impossible for me in fact, to get the bike rocking as it would outdoors while on a rocker. It goes down in sync with the pedal downstroke, opposite of outdoors, maybe taking some watts out of the stroke, and making for an awkward feel as well as some pain in the knees. I can see where a little bit of movement while seated can help, but a little bit of cushioning under the legs might do that just fine. I think Lama had the same reaction, but for me the whole rocker thing just isn’t tracking yet. If someone could figure out a way to get the bike rocking in sync like outdoors I could see the attraction, but short of creating a powered suspended gimbal system, I have no idea how that would be possible. I think it might work if someone could figure out how to make the rocker pivot point about where the hubs are in height instead of at the base. Maybe I just need to try some different seats like the SQ to deal with seat comfort on long trainer rides, or just stand every once in a while. I cover this all in the section titled “One More Thing” for the other models. And the majority of this post talks to what their doing with respect to protocols on this trainer. Also compatible with The Sufferfest! Two years late and dollars short. I loved my old Kinetic trainer. I put close to 10k miles on it and was happy with how solid it was. When they brought out their Smart Control, I took the bait and bought it to upgrade. What a complete waste of money for a control that just did not work well, was buggy, would lock up frequently in Zwift, and otherwise just provided a miserable experience. I didn’t care about the lack of standards, I just wanted it to work well with Zwift, and it couldn’t do that. Promises were made to fix it, that never came to pass. Their response and comments on your posts were dismissive and did nothing to help their case. Not great for a company. I sold my Kurt stuff and went with the Wahoo Kickr, as it looks like many, many did in the reader comments on your Smart Control post. It’s unfortunate that it was so bad, and left so many people with a bad taste in their mouths. I hope this one is leaps and bounds better and just works, a sentiment that probably a lot of people share. I am in the market for another trainer for my daughter to use as she trains for triathlons. If they can get this right (and lower the price), I might bite the bullet. I can’t wait to see your in-depth review that will hopefully show this as a viable alternative to the Kickr and others. Interesting trainer. Thanks for the nice review Ray. Little question here about that line in your table that says “Temperature Compensated”. Is it not redundant as the accuracy already gives all the relevant info (assuming that the accuracy is covering reasonable working conditions)? Kinetic R1. After many years of Rock and Roll ownership, side-to-side movement is subtle in contrast to Kinetic R1. At least that’s what I noticed from your video. I could be wrong but movement (e.g. 15 degrees) exbibit little effort from your end. On the relevant note, how would you describe side-to-side movement Kinetic R vs. KICKR CORE? It must be dramatic since KICKR CORE barely rock side-to-side, right? Perhaps adding CLIMB to it will exhibit more side-to-side movement? I have a R&R. It feels roughly similiar, but I think it’s been since mid-summer or so since I rode the R&R. Once I’ve got both in side by side, it’ll easier to compare. The CORE doesn’t really rock anywhere. I’ve seed people make this type of comment before as well. Why would you expect a Climb to add rocking motion? It replaces a wheel, that is already very narrow and actually meant to be leaned over. It’s arlready “unstable” in reality. Similarly, the Climb attaches to the front of the bike and does nothing to alter the real source of stability… the trainer itself at the rear of the bike. If you want to add rocking motion, the place to start is the rear of the bike… not the front. CLIMB is not as stable as front wheel in the riser ring. Assuming that you actually use the riser ring. CLIMB does add instability with more side-to-side movement. When you dance on the pedals outside, the front of the bike rocks side-to-side as well. > CLIMB does add instability with more side-to-side movement. >When you dance on the pedals outside, the front of the bike rocks side-to-side as well. if you are using it with say a RR, does it role more than a wheel ? And why ? as you can’t use the incline ? The Kickr is designed to be used WITHOUT a front wheel riser. That is the whole reason the rear of the trainer is adjustable. It has settings for the common wheel and tire sizes, to give a level axle arrangement. So, it is perfectly reasonable assume that people may not be using a riser. Additionally, not all risers provide the level of side support you imply. Many offer a simple and slightly curved support that is not adding any significant stability. I disagree, based on the comments above. The Climb has a certain amount of stability and will not fall over. Watch the “punching bag” section of Shane Miller (GP Lama) and you can see that it wobbles a bit, but will not fall over. I confirmed this with my unit when I installed it last Friday. Yup, and that motion is why many of us have added rocker plates to gain that freedom from fixed trainers. Those of us with Wahoo Climbs used full length rocker plates to support the trainer and Climb, and allow the whole setup to rock. It works really well, even with the Climb installed. Hmmm, the rocking doesn’t seems natural. Only a motion gyro effect will work. Good for Kinetic. Too bad in the interval I finally gave up and moved to a Tacx. I look at my old Rock n’ Roller in the corner collecting dust and often wonder if I could put the Tacx onto it somehow and effectively have a Rock n’ Roller. I really do miss the ability to get up and climb or sprint the way I would in real life. Sigh. If you haven’t see them yet, many people are happily adding a Rocker Plate (basic component name, not a brand name) to their rigid trainers. It is an assembly that is set on the floor, with the trainer on top, that allows the same rocking motion as the original Kinetic Rock & Roll trainers. I run the Zwift Rocker Plate group (linked via my name or you can do a search in FB). We cover and discuss rocker plates of all variations. We have info on home-built DIY designs, and the emerging commercially sold models as well. Check us out if you want to learn more and either build or buy one for your Neo. I am happy to help and answer any questions about them. I feel they are the best upgrade a person can add to their indoor riding to improve comfort and the overall experience inside. So the big question… I was ready to pull the trigger on the Kickr Core but I did have some nagging thoughts on how comfortable a fixed trainer would be. I didn’t like the idea of having to spend time (DIY) or money (commercial solution) for a rocker plate in order to make the trainer more comfortable but since I’m new to the game I really don’t know how necessary and/or beneficial a flexible trainer might be. Lo and behold, Ray introduces the R1. So here’s the rub: Is it worth waiting a few months and, pending a good review, spending $150 more to get a non-silent rocking trainer, or just buy the Kickr Core now and see how I get on? For clarity, this is clearly stated as a “First Look” that is not the same level of info or worth as a “Review”. Taking anything more than a basic idea of this trainer is a mistake at this time. As to wheel turning and rocking function, there are MANY of use using successful implementations without a free-rotating front like the KK Riser Ring and it’s associated bearing option. Some people insist a turning front end is needed, but after 3 years of use on mine, I challenge that assertion every time. It is not true. However, I do think adding one (with the addition of a centering spring as well) can possibly improve the experience. But it is by no means “necessary”. In fact, I find (as other have) that a free rotating front with no centering (as the KK option is) feels WAY too loose. It does not replicate the way a bike rides with the Trail of the frame and fork. A rolling bike will naturally recenter the bars and fork. The KK rotating version does not do that. It leads to the same “flop” that is seen when you lean a bike that is not rolling. Not at all representative of a bike on the road. That is why I feel a centering spring option is best, if and only if, you choose to add that degree of freedom. All that said, I also agree that I’d be hesitant to buy an R1 until a full fledged review at the very least. Not to mention I would wait a few months to let others be the paid beta testers (as we saw with the Smart Control units). We can hope they learned from those and other related mistakes, but their track record on electrical trainers and devices makes me question the initial units. I tried a Rock n Roll a couple of years back and hated it. As you can see from the GIF of Ray riding it, you can sway all over the place and I constantly found myself trying to centre the bike. I always felt like even in a neutral position, the bike was always leaning a little one way or the other. Got a Road Machine and never looked back. 1) Did you try adjusting the tensions bolts with elastomer at the base of the trainer, as per the manual? This allows to change/ reign in the amount of swaying quite dramatically. For me, out of the box the tension was too low and the swaying was too much. It also very much depends on the weight of the trainer+bike. 2) Rock’nroll has to be very, very level on the ground. If it is not horizontal by tiny little bit, it has the tendency to lean on one or the other side. This shows one reason I prefer my DIY rocker setup with 2 leveling springs (inflatable balls) on either side of the center pivot. 1) It allows for a wider range of adjustablity in force, preload and such to suit a variety of weights and preference for feel. 2) It also allows different pressures in each spring to make the top level, even if the floor is not. 3) Their original R&R design and the cantilevered support lead to bounce when standing and even when seated for heavier riders. That is the reason I made mine with a full support axis under the axle to prevent bounce. At least they seem to have addressed that with the new R1 design. It’s true you can feel like you are leaning to one side with the Rock and Roll Smart Control, and it is very annoying. But, it’s very easy to fix. You simply reposition the bike on the roller towards the direction of the lean, so it is not centered on the roller. That will counter the lean. Then lock the bike in place as normal. In my case my left arm is considerably shorter than my right due to a childhood accident. So I naturally lean pretty far off to the left side. I was able to correct that problem by using the approach above, and now it’s dead-neutral. I don’t feel like I’m swaying all over the place. I get just a little movement which adds a lot of comfort. I only weigh 138 lbs/63 kg so that may make a difference. Sounds like a user error. I have been using Rock and Roll for 4 years. If you are swaying on a trainer, you must be swaying on the road as well. Which is pretty common for non-competitive riders. My wife is swaying the trainer at ~100 watts with hips and upper body. My pedal stroke is fluid, legs like pistons. I’m not swaying the trainer at ~300 watts, unless it’s out of saddle effort. Maybe, but “must” is a strong word. Keep in mind the complete lack of the natural centering that comes from riding a bike outside. The geometry of the frame/fork via the wheelbase, head tube angle, fork offset and trail all lead to specific stability. The leveling springs in a Rock and Roll (and other rocker plates) aim to replace that magical force above. There is great variability in personal experience and rocker setup. As such, some setups and riders have an easier time than others. I find the Rock and Roll to be less successful than my own rocker plates. There is a notable difference for me between them. I know some people like a stiffer setup with a more notable “centered” feel when on the trainer. This whole feel is something I plan to cover in detail for my FB Rocker Plate group and to inform potential users. There is need for adjustability to meet varied rider weights, experience and even preference. Point being, calling someone out and effectively criticizing their riding is not helpful and is unnecessary. I agree with you comment regarding criticism of riding style, especially without any real evidence that is the issue. I used a Rock n’ Roller for 3 years. There is nothing like it for out and out up on the bike sprinting. I loved doing the short sprints in Zwift with my Rock n’ Roller and other trainers have no where near the same motion. As for leaning, etc., the unit needs to be level, and there are two bolts that can be adjusted to provide the same feel as the road. I also believe that the feeling would be better with Kinetic’s front wheel support which moves, just like my front wheel when I am labouring up a BIG hill. If I were in the market (I invested in another smart trainer due to issues with Kinetic’s smart trainer) I would be: 1. Waiting for DCRainmaker to finish a full review, comparing power outputs, AND using the front wheel support (the bike was not even level in his 1st review side to side or front to back). I am optimistic that Kinetic having been stung has made the necessary changes to have a solid unit; price not withstanding. I loved my Rock n’ Roller. One concern I have is, the open bottom black part of the unit where the belt goes into the mechanism vertically looks a little like a “sweat-bucket”. Sweat will migrate towards the rear of the unit, onto the belt and collect in the “sweat-bucket”. This is probably not a good thing for the unit’s longevity. It’s normal, I still regularly use a first generation T1000 road machine and the little pitting is actually from the tire contacting the roller not sweat. The roller is not pitting where the tire contacts the roller. In fact, that part of the roller where the “tire track” is, is as smooth as silk. The roller is pitting everywhere *except* where the tire contacts the roller. So I think it has to be from perspiration landing on the roller and corroding it. I just don’t get it why manufacturers continue to release noisy trainers. We now have the Neo, the Kickr 2018 and Core that are virtually silent. Why would one buy a noisy device nowadays apart due to lack of information ? Because if it is as loud as the old kickr or even the kinetic road machine your fan makes more noise so it doesn’t really matter. Have you heard anything new about the new SmartControl units for the Rock and Roll, which I already have and love, but my current Smart Control unit is for the birds, works sometimes. I have the new unit, but just waiting for firmware on/for it. Should be any day now. Expected ship date is basically next week (5-7 business days). Though I suppose technically that could be the Mon/Tues afterwards. Either way, if you use DCR Reader Coupon Code DCR10BTF you’ll save 10%, plus you also get free US shipping. I’ll be travelling the next two weeks, so the earliest I’d be able to start digging into a unit is mid-October, with a review likely by late October (I know lots are interested in how this performs, especially from an accuracy standpoint). Might even be the first trainer to go through a review process in the new DCR Cave/Studio! I asked mid-last week. Kinetic had all their first batch units get stuck in customs, and they said they had just gotten them out and were on the way to them. I don’t know what that means in terms of delivery though, but I’ll check back today or so and see where things stand. Current user of the rock and roll smart control here… I would love to know if there is an upgrade path from existing to new protocols, i.e. Bluetooth standard as opposed to proprietary. Hopefully, the need for new hardware is merely to employ both Bluetooth and ANT+ ? Hardware-wise it’s different from a communications chip standpoint. I don’t know if they plan to offer any sort of upgrade/swap option. The new hardware is merely though for ANT+/BLE compatibility, so it won’t impact your existing setup if you’re all good with what you have today. I am currently training indoor but on old progressive resistance trainer. I want to continue design my workouts in trianingpeaks and use garmin 520 for workout and use smart trainers ERG mode. But is there a possibility in my workout file after the workout see power data from my power2max, not data from trainer? I wan to be consistent between indoor and outdoor power. Is this possible with R1? Any chance of pre-ordering the upgraded smart trainer motor unit for the Rock and Roll from Kinetic yet? If no, then when might we see this unit, a mini review or something from them? I asked Kinetic and they confirmed that the resistance unit stand alone for the wheel drive trainers will be available for sale at the same time (any day now) as the full trainer setup. If you have an existing trainer with a stand and want to upgrade this is a workable way to do it. I have also made that connection and they said sometime this week for the Smart Control Resistance units!!! Just waiting for them to announce a trade up discount for those of us sticking with Kinetic through the hard times!!! They said “We have talked about it, but have not come to a conclusion.” Look Kinetic, a 100 discount won’t kill you and it will make people like my brother, who has always been on kinetic, through the difficult years with smart control 1, stick to the brand, when jumping ship would be so easy. Love my Rock and Roll, but not the smart control unit, which I cannot get power on my garmin, but used it anyway…Brand Loyalty here Kinetic, OFFER A DISCOUNT!!!! Out of curiosity, which trainer is looking like it’s the best bang for the buck: the tacx flux that’s on clever training for $699 or the new R1? Given the R1 is $450 more, I’d argue the Flux is the best bang for the buck pretty easily. Now, bang for the buck is all about value (bang) for a given price point (buck). So kinda comparing Apples to pears here to be honest. A better comparison would be Flux vs Kinetic Smart Control series. Are you able to use power match with the kinetic, am I correct that the last version you could not? Not yet, no. I don’t quite have a unit yet. Can you actually use this with a thru axle? I’m about to sell my Hammer because the body of the trainer around the rear non-drive side axle is shaped such that you can’t actually rotate the TA lever very much, so worst case it’s almost impossible to mount a bike because the threads don’t engage and best case it’s still a huge PITA. The only picture above that shows that side makes it look like the enclosure body would also be in the way. It a little silly how many trainer companies are coming out with TA “compatibility” but it’s obvious they never actually tested a TA bike on the unit. As usual, Wahoo seems to be the only one avoiding dumb mistakes, but I really like Rock n Roll feel so I was excited about this one at first. Ray, I’m looking forward to your review on this trainer to see if you are having the same experience as I am. I just went from a Kickr to the R1 and am not impressed so far with the normal trainer stuff. The rocking is great though and it has a solid build quality. I’ve got a support ticket filed and yet to hear back after two days. It seems like the firmware is still very much in need of improvement. I’m using it within Zwift, the ERG mode seems inaccurate, calibration within the Kinetic In Ride app also has a weird bug where it tells you to ride up to 25 MPH but stops somewhere in the 22ish range, and the resistance at lower RPMs when spinning up it is insurmountable. It also only seems to broadcast an ANT+ signal but not an FE-C. The Wahoo Kickr always has two signals ANT+ and FE-C. I have read similar problems from a user on the TrainerRoad forum. Seems to be headed in the same direction as other Kinetic electronic product releases (troubles right off the bat, incomplete and confusing app use, and underdeveloped firmware. Hopefully, for the buyers, Kinetic will get these issues fixed and quickly. But past history isn’t reassuring on that wish. Interesting, I don’t have an R1 yet. Brent, I’m curious how your experience has been, if you received it yet? The R1 did arrive Dec 26th but had couple of hardware issues forcing me to exchange my initial R1 so I received a working unit last Saturday. I’ve only had a couple of test rides on Zwift and still really like the rocking motion or even the slight swaying when just pushing hard in the saddle. Haven’t had any connection issues with R1 and will do a longer Garmin Connect workout while riding in Zwift tomorrow. Typically I use Power/Cadence from Vector V3 pedals in Zwift and haven’t done a Power comparision between R1 and V3. To me the R1 makes it feel more like the bike is swaying side to side vs. a rocker plate feels like the “ground” is moving. Thanks for that feedback Brent. I keep looking at rocker plates, as I moved to a NEO, but I just don’t have the funds right now. Great to get feedback from a Rock n’ Roller. Looking forward to your feedback after a few rides. 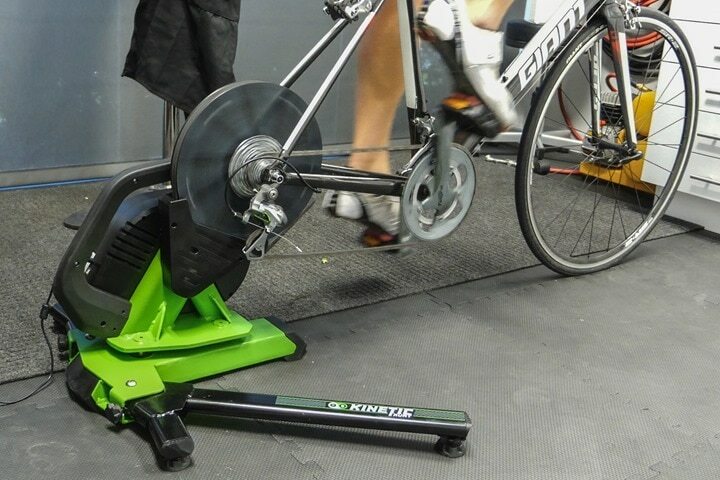 If you get a chance, would you consider riding it once with the trainer as the power source rather than your pedals? I did a couple of short rides on Friday, 10 minute ride, calibrated the R1 and then 20 minutes all in Zwift and the R1 reported significantly different watts then the Vector V3’s. Here’s a summary V3/R1: AVG 187/194, NP 206/241, 5 Sec 441/810, 1 Min 284/341, 5 Min 209/188. Saturday I tried again to warmup and then Calibrate the R1 before riding the Zwift Norseman race but the R1 was reading to high to use in the race. When I ride again this week I’ll record the R1 on the 935 FR and the V3’s on the 820 Edge to get a longer comparison with some higher intervals. Also the R1 is not what I would consider loud but not as silent as either the Neo or new Kicker. Also on both bikes that have Disc brakes w/Thru axles I can’t shift into the largest cassette as the derailleur cage hits a housing/cover on the trainer. The Norseman was a longer ride so I still really appreciate the rocking motion and in-game road feel was good. I won’t ever use the power output so I’ll continue to keep the riding the R1 as the trade-off is worth it for me. I would hope the power output gets closer with firmware updates as well or possibly my calibration procedure wasn’t working. Thanks Brent! I suspected the same things were happening with me on my rides on it regarding power inaccuracy and general responsiveness to terrain changes. I am hoping their firmware eventually handles it, but I am thinking power meter pedals are making the whole unit work a little better than when it uses its own power measurements. I does seem to work ok with ant+ and perfpro software. the trainer communication with the calibrate app seems to have happened after a recent update to the app. at least for me. The new firmware to fix cadence was due a few weeks back and still hasn’t been released. Slightly off topic, but has anyone had better luck with the updated Kinetic Smart Controller add-on? I really like by dumb-downed Kinetic, and I know that the cost of the control unit is close to other wheel on trainers, but I’d like to stick with what I have. Will you have a final review out for this soon? I am interested in purchasing one but am hesitant until I see your review on the unit. I don’t have a unit.